Disclosure: This is not a sponsored post. We were provided with a gift card to buy supplies to facilitate this post. All words and opinions expressed are 100% our own as always. 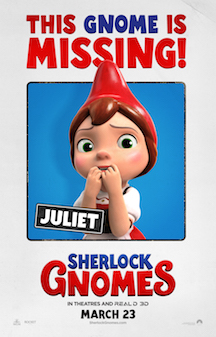 Romeo & Juliet are back in an all new movie, Sherlock Gnomes. This time the adventure takes place in a new garden with all new adventures and some new friends. To celebrate the movie theater release this Friday March 25th and that Easter is right around the corner it was just perfect to make a Sherlock Gnomes inspired Easter Basket. DIY are always fun, especially when you think about the person who will be receiving the gift. 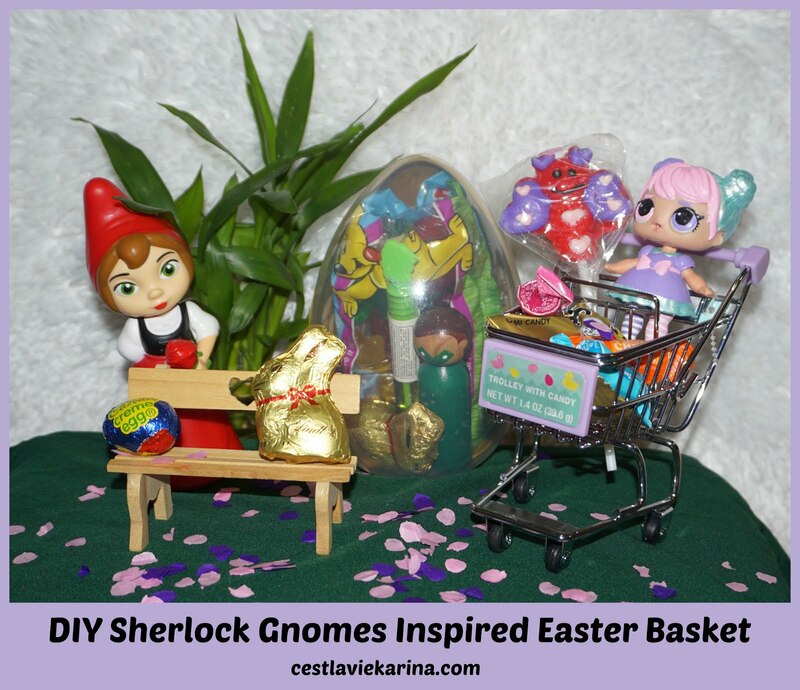 In order to make our Sherlock Gnome inspired easter basket mini supplies would be needed. In this case we would use a mini shopping cart, which can be found at Duane Reade or Walgreens. The mini shopping carts come with gummies, we just made sure to take out the gummies in order to fill it with some of Valentinas favorite treats. The little wooden bench we found at our local craft store, Michales and thought it was cute and could be used to display a mini toy to go with the easter basket. Pictured above are some of Valentinas favorite candies that would be a perfect addition to her basket. She loves Haribo bear gummies, and when i saw the big gold egg filled with them I made sure to grab one that could be filled with an assortment of treats. Chocolates and lollipops are also a must. Valentina is addicted to LOL Surprise dolls, I'm not lying when I tell you that this momma might be just a little bit addicted to them. We have a few doubles of the dolls and I've seen a few that have been customized. Valentina has been asking me to customize one for her and what better time then now. 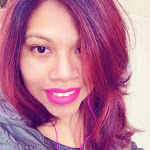 I headed to our local Target and bought some acrylic paint in some fun pastel colors perfect for Spring and grabbed one of the doubles that were stored away. I'd paint her hair, eyes and dress. 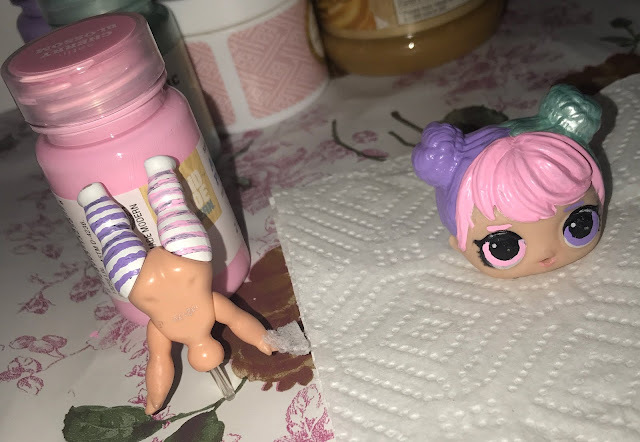 To say I was nervous is a lie because my hands were shaking but I was very excited to customize the LOL surprise doll formally know as Curious QT. Project was started during the wee hours of the night, when Valentina was asleep, it had to be a surprise. It was truly fun to paint and use some of our favorite colors and I'm pleasantly surprised with how cute she turned out. I added a few layers after taking these pictures. After I let her dry overnight it was time to put together our Sherlock Gnomes inspired Easter Basket. In the big egg I'd stuff with some of Valentinas favorite goodies that included the gummies, a chocolate, a mini bubble wand, a chocolate coin, and a little wooden superhero. She's addcited to superheroes, especially after watching Marvel Universe Live! I added her customized doll in the little shopping cart and put some mini gummies on the grocery side. Next to it her egg with special treats was added. When Valentina saw her Sherlock Gnome inspired easter basket she squealed a little. Especially because all the things she loved were included. Everyone knows that all DIY are appreciated more than store bought, it always adds that special touch. 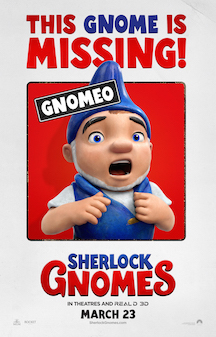 Just watching the trailer makes me want to go watch Sherlock Gnomes already.